Miranda Bennett Studio has been with FELIZ since the early days. It's been a joy to watch her company grow and evolve from her humble beginnings dyeing, cutting, and sewing all on her own in a tiny East Austin studio. Now MBS is operating within a much larger studio with a team of women behind the scenes. In honor of Earth Day we wanted to highlight an extra special aspect of MBS, the Zero Waste Collection, made entirely from leftover garment scraps. Read on to learn more about their efforts to reduce their carbon footprint and combat textile waste. You launched your Zero Waste Collection last year. It's been exciting to witness the development and growth of this campaign. For those who aren't familiar with this aspect of MBS, can you share what it is and what inspired the initiative? Thank you, I feel the same way, this has been such a moving and exciting stage for myself and the team at the studio. The Zero Waste Collection is an offshoot of our Zero Waste Initiative. This initiative is our effort to reuse or recycle all of our textile waste as a studio, source dye stuff that is the by-product of other local industries that would otherwise be discarded, use recycled and recyclable packaging, as well as recycling and composting all the waste that we generate as a studio. The Zero Waste Collection are items we are creating and selling from our textile remnants. These are designed both in-house and through collaborations with other artists. The collaboration aspect here has been super rewarding. So far we have worked with master upholsterer Clar Mapes of What to Do, creating her shape pillows (think globes and pyramids) as well as more standard pillow forms in our fabrics - velvets, silk noil, linen - the list goes on as we draw from the entire array of the fabrics in our collection. Over time, we have gone in a tonal direction, with Clar laying out fabrics of different quality but the same natural dye formulas. The result is so subltey nuanced and really celebrates the one-off nature of each panel of fabric that we naturally dye. We have also worked with Hallie Brewer, a multi-disciplinary artist and frequent collaborator with the studio (as well as a FELIZ co-organizer!). Hallie has designed a series of wall hangings using our fabrics that draw inspiration from the Pojagi Korean quilting technique. We hope to soon have those available on an ongoing basis. Other collaborations that we have in development are a naturally dyed baby sling designed with Nora Frank-Cisneros of Beside the Well, this one has really generated a lot of excitement in anticipation of its arrival. We have been taking our time in the design process to make sure it feels just right, balances function with an aesthetic appeal, and offers something not already available in the baby sling market. 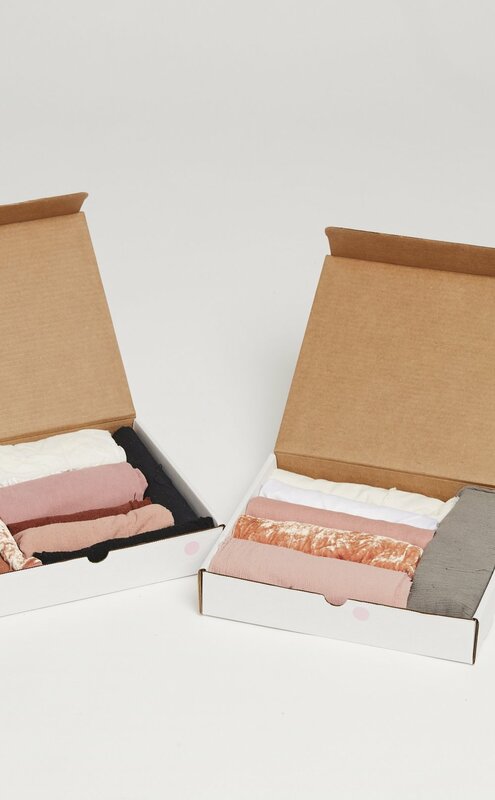 Items of in-house origin include our Zero Waste Boxes of tonally sorted, naturally dyed fabric remnants in various qualities and the Kid's version of our perennial classic the Everyday Dress. Leading up to the launch of this collection, I had been collecting our remnants for quite some time; I found myself utterly unable to dispose of them knowing how much work had gone into every inch. The turning point between hoarding these scraps and having an outlet came for me came a few years in, when I attended a lecture by Jessica Shreiber of Fab Scrap at the BFDA. Her description of the amount of textile waste going straight to landfills for lack of large scale textile recycling options was jarring, and her efforts and passion in the creation of her now thriving company was utterly inspiring. I left there knowing I wanted to come up with some creative ways that we could be a part of the solution from our home base in Austin. So many exciting events coming up for MBS, one of which is an event next week (April 28th) in promotion of the fashion activism movement, Fashion Revolution. In early May you'll be at a sustainable fashion symposium hosted by Eileen Fisher and Fashion Revolution called The Future is Circular. Why is this dialogue around sustainability in fashion so important and what do you hope consumers take away from it? There is a lot to say on this topic and a lot that has already been said. For me, one aspect of this conversation that is very important is bringing this notion of circularity and accountability for the waste that we as fashion designers create as an industry on par with the design ethos and creative direction of a brand. I would like to see more of an emphasis on closing the gap between designing purely for aesthetics and designing with an eye towards reducing waste. For so long, there has been this divide that has made these two notions seem mutually exclusive. Often, the high fashion world relegates "green" brands, putting their commitment to environmental stewardship ahead of any discussion of their aesthetics, not seeing fit to include them in the conversation of relevant brands based on merit of design alone. There has been this underlying attitude that you cannot be relevant, industry savvy AND environmentally minded. Thankfully, this notion is thawing a bit, season by season. Even some high fashion brands have now joined in the conversation of circularity knowing that from a marketing standpoint, it serves them to no longer ignore this conversation. My hope is that all of us as consumers start to ask questions and inform ourselves before making a purchase. Learn where your clothes are made, who made them, what happens to the waste created in the process, what types of fabrics they are composed of, etc. One of the most powerful taglines from Fashion Revolution is #whomademyclothes. This really could not be more important, as it is a concise and meaningful point of entry into a much larger conversation. We have come too far to still have workers dying in factory collapses, children losing their youth to labor exploitation, rivers choked with chemical dye run-off, fabrics that don't biodegrade or get recycled. As consumers, we literally have the world at our fingertips and more transparency than ever, so it is up to us to ask these questions. If a label is opaque about any aspect of their supply chain, you should wonder why. We have a dialogue between consumers and brands that is unprecedented in the post-industrialized age, let's take advantage of that. Tell us about the event you'll be hosting in partnership with Fashion Revolution on April 29th at your studio. We are excited to attend! I'm so happy you all will be attending. This event is all about opening the doors of the studio to our community! I am personally really excited that there will not be any retail or sales aspect to this event, but instead the opportunity to tour our facility, see one of your garments go into a dye vat, participate in our#thefutureiscircular rebate program by bringing back a well worn MBS garment in exchange for a 20% coupon for future use, enjoy a free Zero Waste Box to take home and craft with, and, most importantly, just hang out and connect! You can find the full event details here. Hope to see you all there! Swing by the Palm Door on Sabine May 6th from 11am to 6pm to see the latest from Miranda Bennett Studio, sip on a drink and have a relaxing Sunday. See you there!